It’s 2018! Let’s all come to terms with and accept the truth that more than one billion people utilize social media channels as part of their daily lives. Social media is the next step in a world of creating business opportunities and engagement with clients. It’s a communication bridge that lets customers provide feedback and engage with brands and businesses in real-time. As both the freight and logistics sector advance in digital age, it is very important for us to work with technology and social media to be more efficient in creating connections with our customers. Aside from being a powerful communication medium in the digital age, social media has turned into an effective form of marketing tool that’s now a must to utilize if you really aim to reach your goals. Logistics has always been on the frontline of cutting-edge technology, and with social media, lots of new doors have opened which utilizes technology for marketing and highly effective communication. In choosing which social media platforms for your needs—Facebook, Twitter or Instagram, and the people who will be involved in the project—you must first determine how your staff engage with people via social media. As we’ve all witnessed, Facebook and Twitter are effective channels in which you may connect with your audience, but the real strategy you can use is by creating content that provides solutions and connects your target customers to your business and helps regular engagement with your clients. It is a totally cool idea to have a social media expert in your team whom you can achieve by hiring someone in-house or through back office outsourcing solutions. A content manager makes sure that your social media plans will be carried out effectively and issues will be promptly addressed should they arise. Social media gives you and your team to engage with customers and deliver your brand statement to your audience whether you are inside or outside the office. In the transport, shipping and logistics industry, your market is on social media, and you and your team should always be where they are. With your clients, service partners, and team all connected—it would be really cool if you keep your social media interaction open and fun. This setup is conducive to boosting employee morale and outlook, thus resulting in a noticeable reduction in training and HR expenses. If you choose to embrace an open social media policy, you should always keep in mind that you must have guidelines in check to make employees aware of how they should act in a way that represents the brand. Social media is not only a venue where you can showcase your brand and make the market aware of your company’s expertise in logistics and shipping, also serves as an outlet to connect and engage with the logistics community, thus sealing your good reputation. Find a local charity or outreach to connect with and have your team’s involvement in the cause. Having corporate social responsibilities (CSR) lets you enjoy the rewards of increased loyalty and putting your brand out there while doing something good for the community. 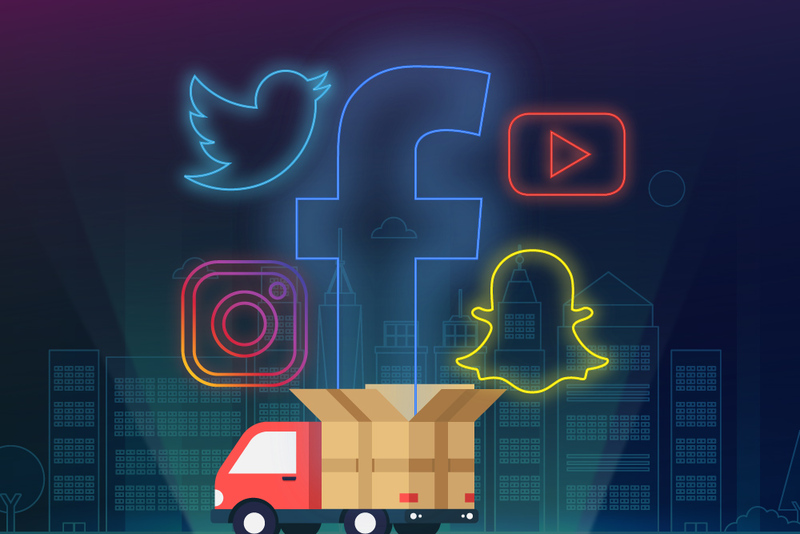 People in the freight, transport and logistics businesses who utilize social media enjoy a lot of advantages if they take their social media strategy seriously. In order for you to make a very good first impression on your clients, you have to do your branding right on social media. You can do this by giving your audience meaningful content and engage with them regularly.